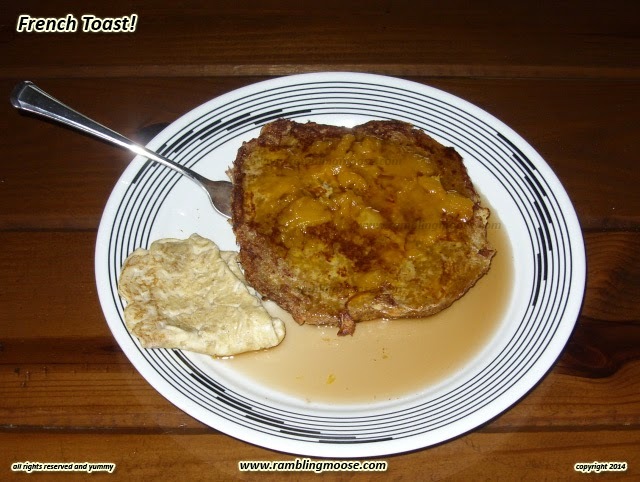 Rambling Moose: French Toast, Finally! It was a meal I had to plan for. What kind of bread to make? I solved that with the Pumpkin Yogurt Bread. I didn't want to take the time to get out the loaf pans and grease them up and ... (cue the teenager in me) it just is SOOO PONDEROUS!!! First I had to get the ingredients but found the pumpkin pie spice had been used up last November when it was actually "normal" to make a pie. Find that recipe and make up the spice. Oooh, it smells like November! Then put the recipe to use by making the bread. There's a problem with making bread in the bread machine. They cook unevenly. If you have an "Upright Loaf" in a tall bucket, instead of being wide, the bottoms of the loaves get "well done". That is to say you end up with something that would rival some Roman Empire Era Produced Ceramic Tiles that vaguely looks like bread. Toss in an explosion from Mount Vesuvius and while Pompeii would get buried, the bottoms of these loaves could possibly survive. I wanted French Toast. Those tough bread bottom pieces would actually serve me well. Sure, you could kill a man with one tossed the right way, but soaked in Egg? My weekend culinary project. Breakfast. It only takes four hours to make. Including all the standing around with baker's OCD staring at the bread machine like an old Liz Taylor joke? What does Liz Taylor do while waiting for the microwave? She screams at it "HURRY!!!!!!!!!!!!" Blame Joan Rivers for that one. After hovering over the machine, it decanted well. I sliced off the inedible heel and set it aside. Tomorrow was time. Two eggs, a splash of milk, a dusting of cinnamon to taste. Whisk it until it begins to froth. Place the floor tile sized piece of bread in the yellow puddle of eggy goodness. At that time I began to poke at it like a caged beast. Grrr, soak up that egg! Making up a mug of coffee would occupy my time. Here's hoping that the caffeine hits after the cooking is done. Poke at the floor tile obsessively a bit more. Flip that beast over for the soft side down to sop up some more egg. Consider what it would take to get this piece of bread into the upper atmosphere and whether atmospheric braking would slow it down enough that it would be cooked by the time it landed. Mentally note that if you did that you had to be nearby to fight off everything from Ants to Killer Bees, Reticulated Pythons named Monty, and a host of introduced beasts that were rarely helpful to the environment. Pick the egg shell off the floor and walk over to the now hot griddle. Warmed electrically to 375F, a plank of cast aluminium casts off a significant amount of heat. Spread some butter on the griddle that immediately infuses the room with the sound of sizzle and the scent of Elsie the Cow. Stab with a fork that Roman Pumpkin Floor Tile rescued from an Aerospace fate worse than death. Allow the excess to drip off and plop it down on the butter. As the heat hit this eggy slab of bread, it sang. The room sizzled. Poke at it with a pointy fork again to make sure it didn't stick. I let it cook to a golden crust and flip. Time to repeat. After that finished, pour the left over egg wash onto the skillet and soak up the rest of the butter while making the end to a great breakfast. Sometimes good things really do come to those who wait. Even if it takes three different recipes to make it all come together and the better part of an afternoon with an overnight sleepover party in the fridge with the mango jelly. Yes, serve with Mango Jelly for a little tart bite, Vermont Maple Syrup warmed to top it off.